The Breville BES920XL is a feature-laden, attractively-priced double boiler espresso machine designed for the prosumer market. Like most Breville products, the BES920XL is an aesthetically pleasing home appliance, with a high SO acceptance factor. It is sized appropriately for most kitchens, and fits neatly under standard countertops. Those with overhead cabinets who wish to use the cup warmer will have to make other arrangements. Breville was kind enough to furnish a loaner espresso machine to Home-Barista for review purposes. The BES920XL (along with its predecessor, the BES900XL) are often referred to by the BDB (Breville Dual Boiler) acronym. BDB ergonomics are, quite simply, outstanding. There is an impressive attention to detail at all levels. For example, rather than legs, the espresso machine sits on retracted wheels. Under the drip tray is a lever than allows you to lock the front wheels up, so the machine stays in place. For minor adjustments, tilt the machine back slightly, and you can roll it on the back wheels. Other welcome ergonomic touches include a small storage area under the drip tray, the ability to refill the water reservoir from either the front or back of the machine, and a cute popup float that warns you when the drip tray should be emptied. Little touches like this make a big difference in user friendliness. The BES920XL provides the ability to easily drain the boilers. Kudos to Breville for implementing a feature that really should be available on all espresso machines. I compared the BDB with two other espresso machines: Gaggia Baby and La Spaziale Vivaldi S1. The dual boiler BES920XL is priced similar to several low-end HX espresso machines. The Gaggia Baby is a single boiler espresso machine aimed at the first-time buyer. 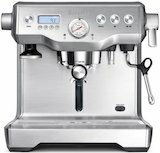 The Spaziale S1 is a fully plumbed, rotary pump, dual boiler, single group commercial espresso machine designed for professionals and serious home enthusiasts. I experimented with a wide range of doses, brew ratios, temperature settings, and shot times on the BDB. For comparison purposes, I used the same grind on different machines, with a "normalized" dose (~18g for 58mm double baskets and ~15g for 53mm double baskets), target brew ratio (67%), and shot times (25-30 seconds). All three machines are capable of extracting an excellent shot of espresso. However, there are obvious differences in usability, consistency, and ability to tweak extraction parameters. As you might expect, the Gaggia comes up short in this comparison test. Other than dose and grind, you can only manipulate shot duration. There is no direct method for manipulating brew temperature, although experienced users may experiment with temperature surfing. The S1 allows you to adjust brew boiler temperature in 1°C increments. The BDB menu system allows easy and intuitive adjustments to brew temperature in 1°F increments. You can adjust the duration of preinfusion, and even adjust the amount of preinfusion pressure (as a percentage of full pump pressure). 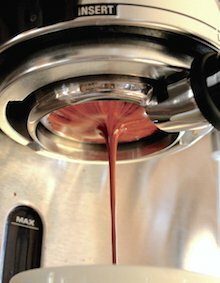 The Gaggia Baby, although capable of excellent extractions, clearly shows its limitations when compared to the double boiler espresso machines. The small boiler and lack of brew temperature adjustment resulted in one-dimensional flavor profiles and the least interesting shots. Milk-based espresso beverages are always problematic with single boiler machines and the Baby is no exception. The BDB and S1 offer stable brew temperatures, plus the ability to manipulate brew temperature precisely and reproducibly. This translates into a full range of flavors in the cup, and a greater realization of the potential of a given roast. Dual boiler machines generally excel at milk-based espresso beverages, allowing you to pull the shot and froth the milk simultaneously. Comparison tasting between the BDB and S1 generally resulted in small but discernable differences in the cup. This may be attributed to basket size (58mm vs. 53mm) and shape differences. In general, the BDB extractions showed slightly more sweetness, clarity, and separation of flavors than the S1 pours. The S1 extractions were thicker and richer with better mouthfeel. Neither was demonstrably superior. Both espresso machines clearly highlighted the varietal characteristics of the coffee. Because latte art quality microfoam is easy to obtain from the BDB, but somewhat slow, it gets mixed reviews from cappuccino and latte lovers. As noted earlier, all three comparison espresso machines (Gaggia Baby, Breville Dual Boiler, La Spaziale S1) can produce good espressos. But there is a big difference between the machines when it comes to milk-based espresso beverages. The Gaggia Baby, like all single boiler espresso machines, is marginal for making even one milk-based espresso beverage. You must decide whether to pull the shot first and then let it sit while the boiler heats up to steam temperature for milk frothing, or steam the milk first and then let it sit while the boiler stabilizes at brew temperature so you can pull the shot. This results in a classic "damned if you do, damned if you don't" situation, which rapidly becomes unmanageable when making multiple beverages. The S1, on the other hand, is a steam demon. Frothing 4 ounces of milk takes under 10 seconds; smaller quantities of milk are a challenge. Multiple milk drinks are no problem; you can bang out one latte after another, steaming up to 8 ounces of milk while you pull the shot. The Breville Dual Boiler takes 25-30 seconds to steam 4 ounces of milk. Even after bumping up the steam boiler temperature (the menu allows adjustments from 265-285°F), the BDB always took over twice as long as the S1 to steam equivalent volumes of milk. The steam wand itself is nicely designed, the lever/dial allows good control over steam, and it is easy to produce good, latte art-quality steamed milk. However, due to the somewhat anemic steam power, it's difficult to recommend this machine to "big gulp" latte lovers. The Forgiveness Factor rating captures how well the espresso machine tolerates minor errors in barista technique. For inexperienced baristas, or anyone staggering half-asleep into the kitchen for their first shot of the day, this rating is a better predictor of quality than the espresso machine's specifications sheet. Thanks to well-designed controls, consistent brew temperature, and an intuitive digital menu system, the BDB merits an enviable 4 stars. The Espresso Performance rating judges the espresso quality a barista with moderate experience should expect on a daily basis. In recognition of the ease of pulling even, consistent extractions, the BDB ranks highly in this category, with an impressive 4 stars. The three heaters (steam boiler, brew boiler, grouphead) yield speedy warmup times and excellent temperature stability. The Cappuccino Performance reflects the ease of making quality milk-based espresso beverages, such as cappuccinos and lattes. In this category, the BDB earns 3 stars due to the somewhat weak steam pressure. For small milk drinks, first-time buyers won't mind the slower pace of milk frothing, since it offers plenty of time to finesse the development of microfoam. But for preparing lattes with 8 ounces or more of milk, the BDB is slow. If large lattes are your passion, you may be frustrated by the Breville's greater than one minute steam time. The BDB performance is significantly better than its price would suggest, and represents an excellent value in espresso machines. Breville includes most of the brewing accessories with the BDB: tamper, milk pitcher, selection of microfine baskets, and backflush disk. The design and ergonomics are unmatched, with many sweet touches that are not found on other machines (full drip tray warning, locking wheels for repositioning the machine on the countertop, boiler drain screws). The digital menu system allows quick, intuitive changes to brew temperature, preinfusion, and much more. This is the first time a major appliance manufacturer has successfully brought a reasonably priced, top-performing espresso machine to market. I might quibble over some of their choices (no easy brew pressure adjustment, inclusion of pressurized baskets, Razor tool), but Breville deserves credit for getting almost everything right. Paired with a good grinder, this is an espresso machine that is suitable for home baristas at all levels of ability, earning a solid 4.0 stars for its Overall rating. Without the support of HB sponsors, reviews such as this would not be possible. I would like to thank Breville USA for the evaluation equipment. I would also like to thank Counter Culture Coffee and Bodka Coffee for the test coffees used during this review.